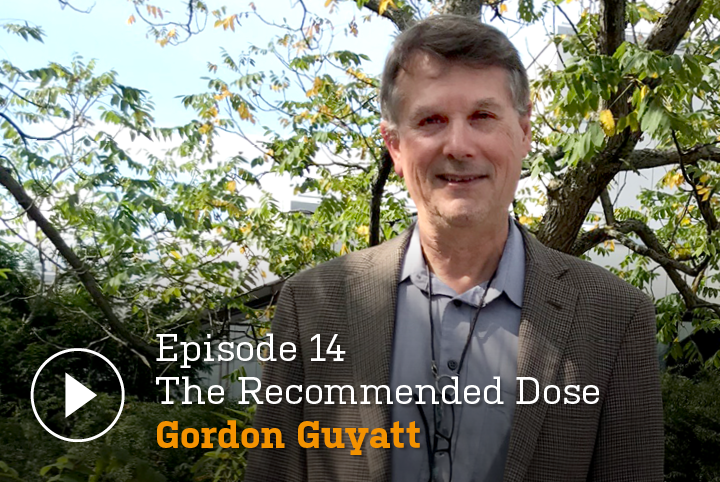 This week Ray sits down with the man best known as the godfather of Evidence Based Medicine (or EBM), Professor Gordon Guyatt. Together they explore the past, present and future of EBM, and look at how an approach encouraging doctors to look more rigorously at the evidence grew into a global reform movement to better inform all our healthcare decisions. Like most global movements, EBM is not without its critics. Acknowledging this, Gordon shares his thoughts on prominent critiques that argue EBM has been 'hijacked' by commercial interests. And on a more personal note, he reflects on his early dreams of being a novelist, his four tilts at election to Canada's Parliament, and the many ways his two very different parents have shaped his world view. Ray Moynihan: Today we sit down with the man who created the term Evidence-based Medicine, Gordon Guyatt, professor at McMaster University in Canada. Hello, I'm Ray Moynihan and welcome to the Recommended Dose. Produced by Cochrane Australia and co-published with the BMJ. In our conversation recorded at a recent conference in Helsinki, Gordon Guyatt reflects on early dreams of being a novelist, his time as a political candidate for parliament and the strong influence of two very different parents. But first, Evidence Based Medicine and how a new approach that started by simply encouraging doctors to look more rigorously at the evidence for what treatments worked and what didn't, grew quickly into a global reform movement to better inform all our decisions. Provoking a backlash from some medicos affronted by the suggestion they were somehow not already basing their decisions on evidence. And like me, you might be surprised to learn that Gordon's first choice for describing this new approach was ‘scientific medicine’, a term he rejected for being even more provocative than EBM. Gordon Guyatt: Evidence Based Medicine was my second choice as to a name for this, which turned out to be extremely catchy. Ray Moynihan: Catchy and very provocative too. Gordon Guyatt: How much was provoked by ... how much was of the provocation was in the name or in what we were claiming about it, I'm not sure. When you talk about the provocation - and indeed it was provoking to many people - we were claiming that the ... to all the physicians who've been trained including the experts, that there was something limited in what they've been doing all these years. Because they didn't know how to read the literature and interpret it and apply it and we were saying to really give optimal care, you need to do this. So this was a rather disconcerting claim for many people. Ray Moynihan: How did you feel when you watched this term just sort of take off like wildfire? I mean this is only 20 years ago we're talking about, it's not that long ago, I mean it's now become motherhood, the idea of evidence based decision making, it's ... we talk about evidence based policy making across different portfolio areas now, I mean ... contract that 20 years for me and just tell me how you felt watching that change. Gordon Guyatt: Well, obviously it was gratifying and exciting and interesting, all those somewhat predictable feelings. I guess I would say there's always the next challenge. So ok, yes, the term's taking off but are people really using it properly? Is it just a patina, a surface layer? Are people misusing it? You know, you've got criticisms that it's been co-opted by the pharmaceutical industry and so on. So yeah, it's lovely to see the term taking off, it would be even more lovely to see the actual concept taking root which it has to some extent, but there ... at every stage there are challenges that one is faced with and limitations in terms of what one hopes to achieve and what has actually been achieved. Ray Moynihan: Before we talk about some of those criticisms i.e. about pharma hijacking it, just briefly, do you think that the move to an evidence based approach is actually resulting in improved care for people. For the people listening, their families, their loved ones, what do you think? Gordon Guyatt: Well, yes. So the first thing is you have had a major focus and I, to a considerable extent, on conflict of interest. And as a result, when I'm asked a question where I'm immediately hit in the face with my intense conflict of interest, it comes to mind. Ok, I'm not an objective person to answer that particular question but yes, of course, I do think that there is markedly improved care that comes from actually giving care that's consistent with the best evidence and one of the things that came along in terms we ... by the end of the first decade, we had realized that there's something that we had missed from the beginning which was that what we now call one of the three key principles of Evidence Based Medicine which is that evidence never itself tells you what to do. It's evidence in the context of people's values and preferences. So I would say ... and that's still getting people it’s ... It turns out to be easier to get people to pay attention to evidence than to get them to appropriately engage in shared decision making for people's values and preferences. But if you put together the whole package of what we consider EBM, both the attendance to the evidence and the awareness that evidence never itself tells you what to do, it's always in the context of values and preferences, yes, it's a march to improve care. Ray Moynihan: Let's just take this criticism, a paper in the BMJ a few years ago, Is Evidence Based Medicine in Crisis and one of the key concerns in that article was that the idea the concept has been sort of hijacked and a lot of the evidence is produced by vested interests for their own ends, how do you respond to that concern? Gordon Guyatt: Well, it is certainly a concern. We have noted the abuse of the evidence – spin - and what the evidence based movement has done is to try to respond to that. So at the conference that we are at at the moment, I give a talk that I give frequently and it comes from a BMJ article that we published some years ago which is How to Avoid Being Misled by People with Conflict of Interest. And so the important thing to realize is people ... there is suppression of data, there is sometimes, through the basic way the pharmaceutical industry lies and misleads - the way it lies is to suppress data and that is a problem. But most of the time the industry-led studies are done well with low risk of bias. So you can believe that… you can essentially believe that the results are accurate what the problem is is in the spin that goes with it, is in the distortion and the way the results are interpreted. Gordon Guyatt: That is absolutely right and that is why the industry has tried to co-opt it but it has raised the standards of the evidence, they are now required to follow certain rules that make it more likely that trustworthy evidence will be provided. Now, they do their best to distort the results and at this conference, we've seen many examples of that, but you're absolutely right, you've also seen in the presentations that the tools of Evidence Based Medicine allow one to deconstruct those messages and see what's really going on. Absolutely right. Ray Moynihan: You're listening to a conversation with Gordon Guyatt, the man who came up with the term Evidence Based Medicine. And we speak next about systematic reviews, those summaries of the best evidence produced by Cochrane and other groups that are the cornerstone of this new approach. And I asked him about his view on systematic reviews and whether he saw them as trustworthy evidence to base our decisions on. Gordon Guyatt: I have to admit that there is some inconsistency in the quality of these but in general, the answer is yes. And there's been then a focus on presenting summaries that are appropriate in lay terms and summaries that are appropriate for the scientific community and so on. And those are definite positive steps forward. Ray Moynihan: So if someone asked you, your friend or a loved one, they're considering having some sort of treatment or test or whatever, would you or do you refer them to things like Cochrane reviews or do you refer them elsewhere, what do you do? Gordon Guyatt: Well, I still have a strong belief in the interaction between the health professional and the patient. And a Cochrane review might be very good, but there is still a background and a context that is very difficult to capture. And if you're the right type of person, yes, the Cochrane review would be great but it would require also learning a lot about the context of the situation and the background. And I, myself, when I'm a patient, I like to have the conversation with the doctor and rely on the doctor as well. What I would tell my friends, loved ones, whatever, is make sure you have a healthcare provider you can trust who is evidence based, and who is able to discuss the evidence with you and put it into context that is most meaningful and appropriate for you. Gordon Guyatt: It is not, I can admit that it is not always easy to find that but that would be the ideal, certainly. Ray Moynihan: Let's move on from Evidence Based Medicine to something else you've been doing in more recent years, helping create this whole new system called the GRADE System. Essentially, I think in a nutshell, are a system for ranking the quality of evidence, for saying "Well, this evidence is reliable but this evidence is not so reliable" and that's important when you're forming guidance for doctors and others. I mean tell me about GRADE and how important you think that's been. Gordon Guyatt: Well, you started this part by saying "Let's move on from Evidence Based Medicine" - I would say "Let's talk about how Evidence Based Medicine has evolved and what is the heart of Evidence Based Medicine at the moment." And I personally think, the GRADE approach again, a big conflict of interest since I've been extremely involved with its development, but it is at the heart and forefront of Evidence Based Medicine. So what was Evidence Based Medicine about from the beginning? It was to differentiate more from less trustworthy evidence, that was there right from the beginning. At the beginning of EBM, it was a useful but somewhat simplistic characterisation or categorisation. Randomised trials were at the top and then observational studies and then physiologic studies and then clinical experience. That was useful in its time and in its place. But what we have done since the year 2000 is to develop a much more sophisticated approach and it says "Yes, randomised trials start as the highest quality but there are all sort of things that can go awry that lower its trustworthiness. Observational studies start as low quality, but you have some instances with huge effects where, in fact, we're quite sure on the basis of observational studies that this is ... it represents high quality evidence of large benefits. Ray Moynihan: The dangers of smoking, for example. Gordon Guyatt: So that stopping smoking, yes, the dangers of smoking, we are very sure about the dangers of smoking and thus, if you can manage to stop smoking we're very sure about its benefits, absolutely right. Ray Moynihan: Without any randomised trial. Gordon Guyatt: Without any randomised trials, that's absolutely right, that's a great example. So what has happened is we've developed this far more sophisticated system for looking at the quality of the evidence and so that we see as the forefront of Evidence Based Medicine and the approach also, this GRADE approach also, we've done a lot of work from going from the evidence to the recommendations and that's an important part of the process that we've worked on as well. Ray Moynihan: And I think I'm right in saying that GRADE, has again, just taken off around the world, lots of organisations using it and so on, is that right? Gordon Guyatt: Well, over a hundred organisations, we like to advertise and nowadays, another ... I think that's happened within academic medicine in the last 10 or 20 years, has been that we now know who pays attention to your articles in terms of their uptake and the amount they're cited and these articles that we have written describing the GRADE approach have extraordinary citation rates. So yes, lots of prominent organisations using GRADE and we're quite happy with its uptake. Ray Moynihan: You're listening to the Recommended Dose, today with Gordon Guyatt, who like previous guests on this podcast, including John Ioannidis and Rita Redburg, is a little sceptical about the benefits of some of the celebrated new medical technologies including genomics and artificial intelligence. Gordon Guyatt: I am extremely sceptical. So we spent untold billions on the human genome project, its impact in medical care has been minimal and telling people they have twice the risk of ... well, first of all, most of these genetic associations are not twice the risk, it's 1.0 - it's trivial increases in risk. Overall, it's been a big disappointment and there have been isolated places where breast cancer risk genes and so on, they've been isolated places, metabolism of some drugs and so on, there's been isolated places where it has really improved care but they are few and far between and they are isolated. And I don't see that changing. So yes, it's made a contribution but in terms of a whole range of ... in terms of the overall range of care, if you were looking at the whole big picture, it's pretty trivial and I don't think that's going to change. Similarly, with artificial intelligence, I think it's being oversold and I'm sceptical that it's going to make a big impact as well. Ray Moynihan: Gordon, let's change track now, let's shift a bit and talk a bit about you, if we can. Let's start with your upbringing. One thing reading about your life preparing for this interview, I was struck by the fact that you live in the same town that you were born in and grew up in, I think. That's rare these days, I mean... we're talking about Hamilton, a smallish, industrial and medical town in Canada near the US border, tell me a bit about that life growing up there. Gordon Guyatt: Well, so why am I still in Hamilton? By a series of extraordinary coincidences. So what was the first? I decided I wanted to be a doctor, but I decided relatively late. So I hadn't done even as much as a single biology course in high school, I'd done no sciences whatsoever, and now I wanted to go to medical school. And I made this decision at the end of my second year of university. So I continued with my English and Psychology which was, I was doing, but then I said "Ok, I'll also take grade 13 science at night," and so as I started this and ... But it was going to be a long road to learn the sciences and get the grades and ... But there was one medical school in Canada, just one, that let you in without the sciences. Lo and behold, that was McMaster University in my home town of Hamilton. Gordon Guyatt: So I get into that medical school. I apply and I get into the only medical school in the country that would have taken me, McMaster. And I then find out that it is not only unusual in its ... in the fact that they're taking people without the science program, but it has what was unique at the time - a problem-based self-directed learning which was suitable for me. I believe it's suitable for most people. So now I'm going to medical ... the only medical school I'm eligible for with a particular approach to medical education which I find highly suitable. Alright! I find out that I'm very interested in this clinical epidemiology. And this same institution has the best Clin Epi department in the world, the place I'm born in is the only medical school I can get into, it has this program that's particularly suitable and that it has the best Clin Epi department in the world, rather extraordinary coincidences! Ray Moynihan: Yes and your family, I think I've already seen your father's family had lived in that area for generations. Gordon Guyatt: Yeah, they immigrated from Britain to that area about 1820. Gordon Guyatt: My mum had a very interesting history of her own, she was a Czech Jew and concentration camp victim. Lost all her family, firstly all her family in the Holocaust, and then immigrated to Canada after the war. Ray Moynihan: And met your father at some point. Ray Moynihan: And I mean do you reflect on how the lives of those two people, your parents have impacted on you and your work and your vision? Ray Moynihan: Or are you your own person? Ray Moynihan: I can see that coming through. Gordon Guyatt: Yeah and I always thought, as I was growing up, I always thought I was a lazy lout in comparison to him and I only realised as a teenager, in fact, I had picked up much of his self-discipline and that has been a huge influence. The other thing about the guy is he was ... he had a real love of the English language and precise use of the English language. So that has influenced me and turns out I've ended up a pretty good communicator in the English language and he's contributed to that. My mother, as a concentration camp victim, had - I think the influence of that is I've had an intense identification with the vulnerable and the disadvantaged and what I referred to before a ... not only a willingness to upset people but perhaps slightly enjoying it, came of the combination of my father ... The other thing about my father, a very competitive, somewhat belligerent type, so I picked up some of that but justifying it when I could persuade myself anyway, that in fact, I was ... my aggressive approach to whatever it is, was on behalf of people who were vulnerable or disadvantaged and that gave me the freedom to justify very assertive approaches. Ray Moynihan: There's so much to talk about your life, Gordon but, I mean you have a whole sort of sub theme going on where you've written, you've been writing columns in the media, you have a big profile internationally, clearly. But I was surprised to read that you've run for parliament several times. Ray Moynihan: And why, why did you do it? Gordon Guyatt: Well, because another aspect of what I was doing, so way back when I was doing my residency training, I helped found a medical group which we called ourselves the Medical Reform Group. And what that was was about its fundamental notion… was that high quality care should be available to all Canadians irrespective of your ability to pay, that was the essential heart of it. Ray Moynihan: A publicly funded universal healthcare system. Gordon Guyatt: Yeah, absolutely. It developed a taste for political activity and ... So I was the one of the group who tended to write the press releases and so on, and of every ten press releases I wrote, one might get picked up and you know… And then, the local New Democratic Party which is this social ... Canadian Social Democratic Party, doesn't exist in the states, but the local writing association came to me and said ... asked me to carry their standard and run in the federal election. And I thought well, unfortunately, it would have been a personal catastrophe if I'd actually won, but I realised there was very little risk of that, but the Canadian elections, the election campaign is 30 days and you have 30 days where you become a public figure and people will listen to you in ways that they won't at any other time. Gordon Guyatt: And so I thought "Ey, here is an opportunity that as opposed to writing all these press releases early in the morning, that nobody is paying any attention to, I can, for 30 days, have a public voice". And that felt satisfying enough that I did it four times. Ray Moynihan: And why would it have been a catastrophe if you actually had got elected? Ray Moynihan: The capital of Canada. Gordon Guyatt: The capital of Canada. But in addition to that, I had my EBM mission to carry out. And I knew I had a strong sense that who knows what I could have done as a politician, my party was very unlikely to ever be in power, so I would just be sitting there in parliament trying to have whatever influence I could as a minority party. Who knows? But I believed that I was making ... there seemed to be some evidence I was making a difference within the world of something also that I knew I was good at and could make a special contribution in. So for those reasons, being elected would have been a catastrophe. Ray Moynihan: Am I right in saying that one of the alternative career paths for you was a novelist, that at some point in your earlier life, you would have liked to write fiction? Gordon Guyatt: Well, very early on. So what I did as an undergraduate is English and Psychology where English was the major and Psychology was the minor. And I was very interested in literature and the summer before I got into medical school, I went off to the Banff School of Fine Arts for the summer in a writing course and wrote the first part of what no doubt would have been a pathetic novel but anyway, I wrote the first part of the novel but probably fortunately, medical school ended all those that because I was completely occupied with medicine thereafter. Ray Moynihan: Any recommendations of books? We often close these interviews with asking people if they've got any books that they're passionate about, they want to tell the listenership about. Gordon Guyatt: Well yes, so this one eludes to an earlier part of the interview when you referred to are you your self-made person or whatever. So I really like the books of Malcolm Gladwell, a Canadian author, and particularly, one of his books is called Outliers and the point about Outliers is that we make far too much of our apparent personal characteristics and ... and of the particularly of very successful people and in fact, if we look at our upbringing and our circumstances and our coincidences, and I feel like my life is ... very obviously a series of such things as I've just told you - about getting into the only medical school I can get into, finding it has the best Clin Epi department in the world and so on, and having the most superb mentorship and et cetera, that the ... and as I say attributing ... I can see easily where some of my personal characteristics have been advantageous such as my self-discipline and my love and skills with the English language, I can trace all of this. And to you know, claim it as anything other than our good fortune seems misguided. And this particular book, Outliers, tells a whole set of stories demonstrating that we completely overplay personal ... some sort of earned personal characteristics when if we look at our ... if we look at how we were brought up in an environment and the good fortune that has attended us along the way, that is what explains our success. Ray Moynihan: Gordon, thank you very much. Gordon Guyatt: It's been a pleasure. Ray Moynihan: That was professor Gordon Guyatt on the Recommended Dose with me, Ray Moynihan. Thanks to Shauna Hurley and Cochrane Australia for production, BMJ for co-publishing, and Jan Muths for editing. If you enjoyed this series, please recommend it to others.